Fighting For Single Payer: Rose Roach Keeps Hope Alive For A Better Way For Health Care In The U.S.
What better time than now to rekindle the discussion about a single payer health care system for the United States. We stand on the eve of yet another Supreme Court decision that could eviscerate the Affordable Care Act. At issue in King v. Burwell is whether the ACA’s language allows the federal government to provide subsidies to people who buy health insurance in states that didn’t set up their own “marketplaces” — those states that rely on the federally run marketplace, HealthCare.gov, to serve their populations. If the Supreme Court upholds the King challenge, the health and financial harms to millions of Americans will be substantial. It is estimated 9.3 million people in 34 states would lose their subsidies within the year, making their premiums largely unaffordable. An estimated 8.2 million would consequently join the ranks of the uninsured. Translated — no matter what the Court decides — the United States will remain the only educated country on the planet that does not guarantee health care as a human right via universal coverage for its citizens. For a quick look at what a single payer health care delivery system is, click here. Although it may have faded from the headlines, the efforts to bring universal health care via a single payer system remain the goal of many. 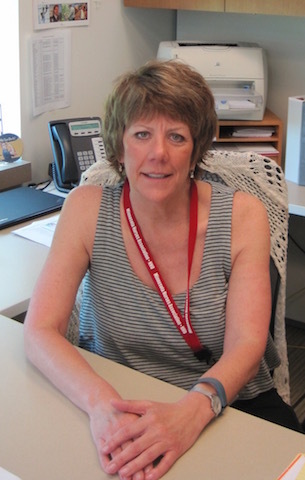 Wisdom Voices sat down recently with Rose Roach, Executive Director of the Minnesota Nurses Association (MNA), to discuss where the fight stands. Raised in a labor household, Roach learned early on the benefits gained by middle class families through union organizing. After a brief political run, and organizing and negotiating contracts for Minnesota school districts, Roach took over as Executive Director of the Minnesota Schools Employee Association in 1996. Working on national school issues connected Roach with the California Schools Employee Association (CSEA), which offered the native Minnesotan a job in 2003. This past fall she returned to Minnesota to become MNA’s Executive Director. “It’s when I ended up as a field director in Stockton, California, as part of CSEA, representing 16,000 members that I started to really see the impact of health care at the bargaining table,” Roach said. “We were seeing more and more of our members go backwards on health and welfare benefits or we were seeing stagnant wages as an impact of increasing health care costs whether it was from higher premiums or out-of-pocket costs. “I made the decision then to dig deeper and find out more. It exposed me to the underbelly of this health care non-system that we have. I became hungry for information to figure this out — that’s probably one of the reasons why (while with CSEA) I became such an advocate around the idea of ‘we have to do something.’ And that something is: we have to remove all the middlemen involved in health care and that’s through a single payer health care system. “We don’t know actual costs because health insurers don’t have to reveal actual cost,” Roach continued. “What is the cost to you as an uninsured consumer vs. someone with Blue Cross Blue Shield or UnitedHealthcare? They’re all different numbers. So what’s the cost? There’s no way to even know. Cost is all driven by what’s so brilliantly described in the article by Stephen Brill about the “chargemaster.” It’s just a number they pick – because they can. And they build profit, shareholder dividend, and administrative fees into that number. And none of that has anything to do with providing people health care. That’s the core problem. We have plenty of health care dollars, we just need to allocate them to actual health care. In her work with CSEA, Roach supported the efforts of former California State Senator Sheila Kuehl to move single payer legislation through the state legislature twice only to have it vetoed twice by Governor Arnold Schwarzenegger. Although the bills never became law, the work done to educate her members and many Californians to the benefits of a single payer system remain a great victory for Roach. “We used that bill to educate our union members in an intensive campaign – one on one education. We talked to classified workers and asked, ‘how’s that health care thing working for you? Not so well?’ We’d tell them, ‘Well the union knows what the fix is – and that’s to move to a single payer system. We were seeing more and more of our members – the bus drivers, and the food service workers, and the maintenance people — making choices on whether they can afford a family plan and having to make choices on whether they can cover a family or not. Nobody should have to make those choices. I saw that continue to happen and deplete this “benefit” on the table, and it angered me. Health care is so innate to us as human beings and to treat it this way is so wrong and so mean. It would hurt my heart every time we got another tentative agreement that took them backwards on health insurance. “We told them, we don’t need to be afraid of single payer, that it’s not ‘socialized medicine.’ We took the fear and the spin out of it and we talked to 40,000 individual members about why we needed single payer. When the opening with MNA occurred last fall, it was a bit of a natural for Roach to return to her home state. “For me this is my dream job,” she said. “I’m in a position to represent nurses. It may sound like a cliché, but nurses are angels on earth. I’m able to tie my work with them into the continued fight for health care justice because MNA has tied achieving single payer in Minnesota as one of its top three legislative priorities. The most recent frustration with moving forward on single payer came last winter when Vermont announced its plans to stop Green Mountain Care. “Yes, it was disappointing, but action still continues on single payer,” Roach said. “You have single payer states groups (California, Pennsylvania, New York, Colorado, Maryland, Hawaii) who continue to work toward it. And the New York assembly recently passed single payer legislation (although final passage in the New York Senate is doubtful). “We will be working with other groups (such as Take Action Minnesota) to organize and educate in communities we’ve never been in before,” Roach continued. It’s about getting into the communities that are most impacted by the viciousness of this system and to have an honest conversation with them. We need people to fear the status quo and not to fear change. For example, Land Stewardship Project, an affiliated organization of Take Action, is in rural communities because single payer makes sense to farmers. It would mean they wouldn’t have to worry from year-to-year whether they qualify for subsidies or not. They could budget for health care. “And as we continue to work a dual track system — because ultimately the only way health care will really be fixed is on the national level—we also can’t be afraid to call out this evil system for what it is,” she said. “The increase in premiums is based on nothing that is real. Or the fact that the United (HealthGroup) CEO (Stephen Hemsley) made $66 million last year and that was based on denying people health care because that’s the only way insurance companies can make money in this system. Hemsley healed no one for $66 million. “And we have to work with labor. If the labor movement wants to take its rightful place in this country again– here’s the issue for them. 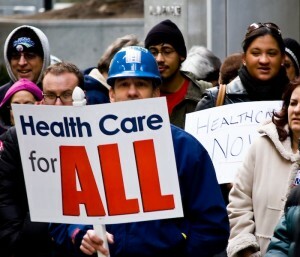 All workers deserve access to affordable health care. Labor has always been at the forefront of numerous social justice issues whether it impacts just union members or not. When we push for a higher minimum wage, union members are already there. We do it because it’s the right thing to do for all workers. This entry was posted in Labor, Progressive Profiles, Single Payer-Health Care Reform, Social Justice, Unions and tagged ACA, Labor for Single Payer, Minnesota Nurses Association, Rose Roach, single payer. Bookmark the permalink. 3 Responses to Fighting For Single Payer: Rose Roach Keeps Hope Alive For A Better Way For Health Care In The U.S. I commend you for your work on a single payer healthcare system. We all deserve to have healthcare and it is and should be a basic human right. The current system does not encourage a healthy society and is profit driven. I believe everyone should have the same healthcare and that includes our President, Senators and Representatives. I believe until everyone is required to have the same healthcare payor system it will never be fair and their will always be a disparity among the rich and the poor. None should be denied the right to have treatment for a disease because they cannot afford it. The CEO pay for the insurance companies really is quite disturbing and I believe unethical…. How do they sleep at night?? The affordable healthcare act will never work because too many other people have the appropriate care so they are not motivated to change it. If we had a single payor system there would be better care and it would be fair for everyone. Just because you have the ability to pay does not mean you should get better care. To lose your life savings trying to pay for healthcare is just plan wrong.